Glutamine is the most abundant amino acid (building block of protein) in the body. The body can make enough glutamine for its regular needs, but extreme stress (the kind you would experience after very heavy exercise or an injury), your body may need more glutamine than it can make. Glutamine is highly in demand throughout the body. It is used in the gut and immune system extensively to maintain optimal performance. 60% of free-form amino acids floating in skeletal muscles is Glutamine. Glutamine plays a very important role in protein metabolism, and it appears to be a very important nutrient for athletes. When supplemented, it may help athletes reduce the amount of muscle breakdown that occurs because other tissues that need glutamine will not rob the glutamine stored in the muscle cells. Most glutamine is stored in muscles followed by the lungs, where much of the glutamine is made. Glutamine has been studied extensively over the past 10–15 years and has been shown to be useful in treatment of serious illnesses, injury, trauma, burns, and treatment-related side-effects of cancer as well as in wound healing for postoperative patients. Evidence indicates that glutamine when orally loaded may increase plasma HGH levels by stimulating the anterior pitutitary gland. Glutamine is important for removing excess ammonia (a common waste product in the body). It also helps your immune system function and appears to be needed for normal brain function and digestion. It’s involved in more metabolic processes than any other amino acid. Some experts point out that glutamine can pass through the protective blood-brain barrier and, because of this, it is known as brain fuel. Aids in protecting the body from ammonia toxicity. Appears to be necessary for normal brain function. Essential for maintaining amino acid balance in the body during times of severe stress. It’s used by white blood cells and contributes to normal immune-system function. Promotes the maintenance of a healthy digestive tract. May promote mental alertness and improve mood and memory. May boost immune function and fight infection. May decrease sugar cravings and the desire for alcohol. Helps to prevent the kind of muscle loss (wasting) that can accompany prolonged bed rest or illnesses such as cancer and AIDS who may be incapable of manufacturing their own supply of glutamine. Side Note: It’s important to note that stress an injury (including surgical trauma) cause the muscles to release glutamine into the bloodstream. In fact, some experts state that during the time of stress as much as one third of glutamine present in the muscles may be released. As a result, stress and/or illness can lead to the loss of skeletal muscle if not enough glutamine is available. Therefore, one of the benefits of L-glutamine is to ensure enough of it is available in the body to help prevent muscle loss (wasting). The proper dosage depends on a variety of factors – body weight, activity level, lifestyle stress, overall health, and diet. Some bodybuilders take as much as 40 grams of glutamine daily. For some, high doses may cause stomach discomfort. 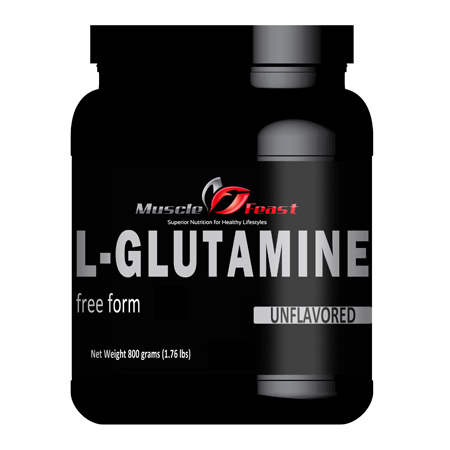 For most people, the recommended L glutamine dosage is between 2-15 grams daily. According to many posts on the internet, supplementing with just two grams of L glutamine daily increased growth hormones by over 400%. However, as of putting together this description for L-Glutamine, I have not been able to come across the details of this study. Start out on the lower end and if you feel you need to increase the amount just monitor how you feel. If you take a large daily dose and feel sick to your stomach, lower the dose. Most of the benefits of glutamine are realized taking 2-10 grams daily so that’s where I’d start. May not mix very easily. May be hygroscopic and may clump during shipment. This does not affect the efficacy of the product; just the texture. Try mixing in sport drink or anything with a ph less than water to improve mixability. It may be necessary to let it sit for awhile. How can our Muscle Feast quality be so high yet prices so low? We are able to keep our pricing so low because we are a relatively small manufacturer with very low overhead and we sell direct to the public. We source the same great suppliers used by more popular brands.